Is There A Premium For Social Enterprises? “As social enterprises can attest, to deliver and grow social value optimally, social enterprises need to succeed commercially and generate financial value” (Growing The Social Enterprise Sector, Chloe Huang). In the long-term, the financial sustainability may prove most important, and the dependence on the label of a “social enterprise” could also be counter-productive. While well-intentioned, the proposal for a “light-touch certification framework that serves as a benchmark” (ST, Jan. 10) may not yield the desired recognition. After all, the assumption is that Singaporeans are more likely to patronise – or perhaps even pay more – if they had knowledge of these companies or their social contributions. In the long-term, the financial sustainability may prove most important, and the dependence on the label of a “social enterprise” could also be counter-productive. It would appear that some of the bigger social enterprises in Singapore – restaurant chain Eighteen Chefs and event and creative agency Adrenalin Group – have succeeded without reliance on the “social enterprise” label. What takes precedence is the bottom-line of the company, and it can be argued that “employing innovative, agile business thinking and processes to meet those social needs [of the organisations]” is often overlooked, as well as the need “to succeed commercially and generate financial value”. In this vein, pragmatism should feature in these conversations. Moreover, it would be useful to ascertain whether retail or corporate consumers in Singapore are necessarily willing to pay a premium for goods and services offered by social enterprises. In its 2011 study, 2,000 interviewees were asked by the Social Enterprise Association (SE Association) whether they would be willing to pay the same or higher price for products or services which were sold by social enterprises. Over 70 per cent indicated that they were willing to, but – in the context of face-to-face interviews – respondents might be less likely to divulge their actual willingness to pay. 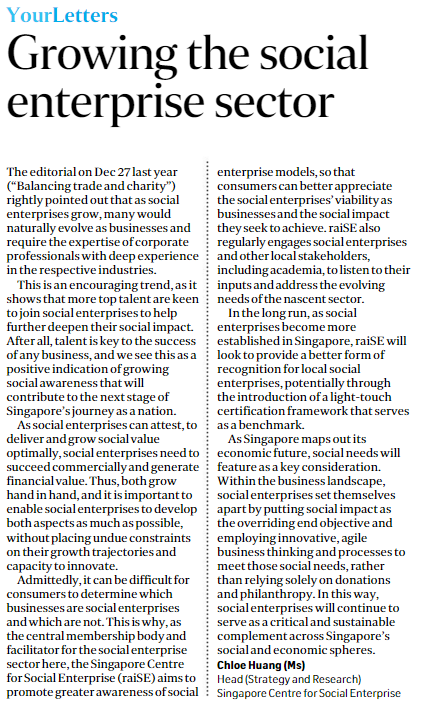 In the same study, the SE Association also conceded that respondents of the study were also briefed on the objectives of social enterprises in Singapore. These evaluative endeavours will determine if attention should be devoted to the recognition of social enterprises – which does not seem to contribute much at the moment – in the first place, or if capacity-building for profitability is more useful.